There’s been some talk about whether the Dallas Cowboys would consider shutting down their 35-year-old starting quarterback Tony Romo for the rest of the season if, by the time he gets back from a fractured collarbone, the team is out of playoff contention. But according to Jerry Jones, none of that talk is coming from Valley Ranch. Jones told 105.3-FM The Fan in no uncertain terms on Tuesday that Romo is going to be back in the lineup on November 22 against the Dolphins in Miami, and he’s staying in the lineup from there. 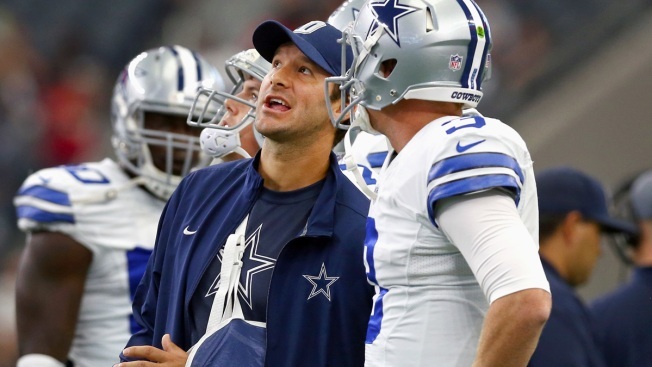 Realistic playoff chances or no realistic playoff chances, Jones wants to finish the season strong--and after watching the past six weeks unfold, he knows he needs Romo to do that. "When he gets on the field against Miami, and it most assuredly will be at this juncture, there's no set of circumstances that we wouldn't play him and play him with hopes of winning that game and winning the rest of the ballgames," Jones said, per ESPN Dallas. "I think not only our game but sports in general, if you've got an opportunity, if you got a chance to win this thing, then you take it. "I know I'm talking in generalities, but specifically, we have a team that could really, from the standpoint of the personnel that's on the field, really be a top team as we get into the last half of this season. We want to show our fans that."